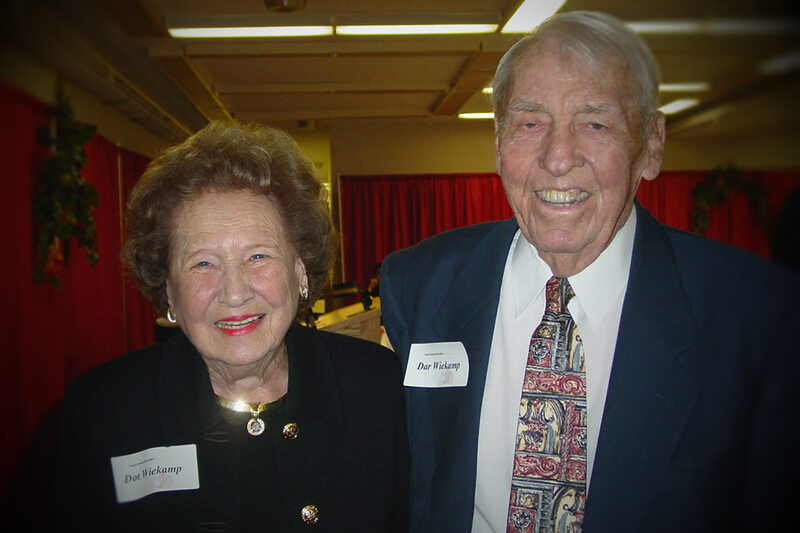 This year, Indiana University South Bend lost one of our most loyal advocates and supporters. Dorothy “Dot” Wiekamp passed away on Wednesday, May 31, 2017. Dot was born in Mishawaka and lived her amazing 103 years within one mile of her birthplace. Dot graduated from Mishawaka High School in 1931 and received a degree from South Bend College of Commerce in 1934. She married her high school sweetheart, the late Dar Wiekamp, on June 14, 1936, at the First United Methodist Church in Mishawaka. Dar and Dot were married for 72 years. She was preceded in death by her husband, Dar, who passed away in 2008, and her daughter, Mary Lou Schwartz, who passed away in 2002. Dot and Dar were lifelong partners. She and Dar lived their lives in service to the community and worked tirelessly for the prosperity of Mishawaka. She was a joyful cheerleader for all things Mishawaka. Dot and Dar were also an important influence on IU South Bend. They were involved in projects big and small. They supported athletics, the library, the Chancellor’s Fund, and the Raclin School of the Arts. They played a key role in the early renovations to the Administration Building and their support for the Liberal Arts and Sciences resulted in the beautiful academic building known today as Wiekamp Hall. During my last visit with Dot at her home in Mishawaka, she cautioned me, “Be careful what you invite me to. I always show up!” At 103, Dot was still full of energy and interest. She will be greatly missed.